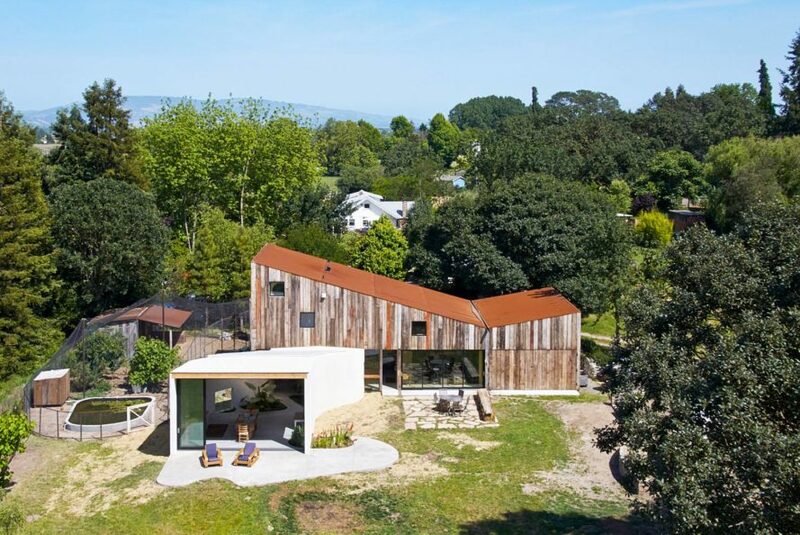 Mork-Ulnes Architects recently transformed an old barn into a charming artist studio in California. The Meier Road project consists of two structures - a recycled wood-clad barn and a contrasting volume with pockets of green, where chickens, cats and dogs are free to roam. The studio sits on a vineyard in Sebastopol, blending with the surroundings thanks to its vernacular architecture. The restored 2500 square foot building shelters an artist studio, office and storage building, and was clad using the old barn’s wood. Its inverted gabled-roof adds a contemporary twist, while enhancing the interiors with double height areas – making it perfect for exhibiting the owner’s works. 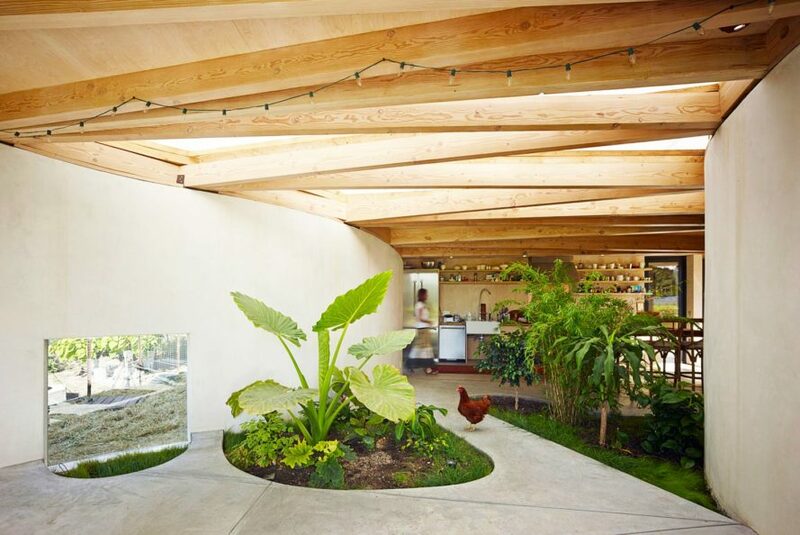 Related: Takeshi Hosaka’s Inside-Out House has Trees Growing Inside! A contrasting modern structure shaped like a white amoeba flows outward from the main building, creating additional living space. Pockets of green flourish on the floor, and the interiors receive plenty of daylight through a skylight placed above a scissor-beam ceiling. Right on the edge, glazed sliding doors bring the outdoors in quite literally — cats, dogs and chicken are very welcome to roam free inside. The studio sits on a vineyard in Sebastopol. It shelters an artist studio, office and storage area, and was clad using the old barn's wood. Its inverted gabled-roof adds a contemporary twist. A contrasting modern structure shaped like a white amoeba flows outward from it. Pockets of green flourish on the floor. Chickens, cats and dogs are all free to roam inside.